GODZILLA ON MONSTER ISLAND 1972 (RELEASED AS GODZILLA WAR OF THE MONSTERS IN THE UK) -- ORIG SINGLE SIDED BRITISH QUAD (30"X40") MOVIE POSTER. THIS POSTER IS IN EXCELLENT CONDITION WITH LIGHT FOLDS. THIS POSTER IS NOT REPRO OR REPRINT , THIS IS AN ORIGINAL THEATRICAL ONE SHEET MOVIE POSTER PRINTED BY NATIONAL SCREEN SERVICE. 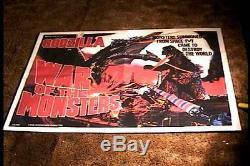 The item "GODZILLA MONSTER ISLAND ORIG BRIT QUAD 30x40 MOVIE POSTER'72 KING GHIDRAH GIGAN" is in sale since Wednesday, August 26, 2015. This item is in the category "Entertainment Memorabilia\Movie Memorabilia\Posters\Originals-International\1990-99".